Coexist with Monsanto or destroy it? Follow the organic money. 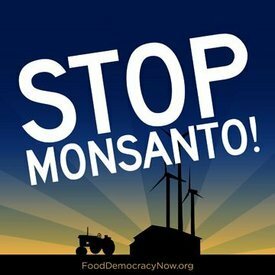 Excellent article By yours truly Jon….couldn’t have said it any better….to take out a huge conglomerate such as Monsanto, we have got to grow some b**** and help this cause get so hot that Monsanto can’t sit behind the closed door anymore…too nmuch smoke inhalation – we need transparency-truth-exposure-action! -A.M.
Take on Monsanto…directly? Take out ads exposing Monsanto? Promote a million people in Washington DC Mall on a Saturday afternoon? Reveal the names of the Congressmen who are defending Monsanto? File new lawsuits against Monsanto? Put small farmers on television who are being harassed and driven out of business by Monsanto? Show the American people the faces of the men and women who spend their lives growing food for us, and listen to what they have to say? Bring the outrage to a boil? Expose (gasp) Obama as the number-one supporter of Monsanto in the nation? Name the people he’s appointed to protect Monsanto? TELL THE TRUTH? The author of two explosive collections, THE MATRIX REVEALED and EXIT FROM THE MATRIX, Jon was a candidate for a US Congressional seat in the 29th District of California. Nominated for a Pulitzer Prize, he has worked as an investigative reporter for 30 years, writing articles on politics, medicine, and health for CBS Healthwatch, LA Weekly, Spin Magazine, Stern, and other newspapers and magazines in the US and Europe. Jon has delivered lectures and seminars on global politics, health, logic, and creative power to audiences around the world. You can sign up for his free emails at NoMoreFakeNews.com.